Summary The Columba Centre on Islay was originally built as a hospital in 1902. 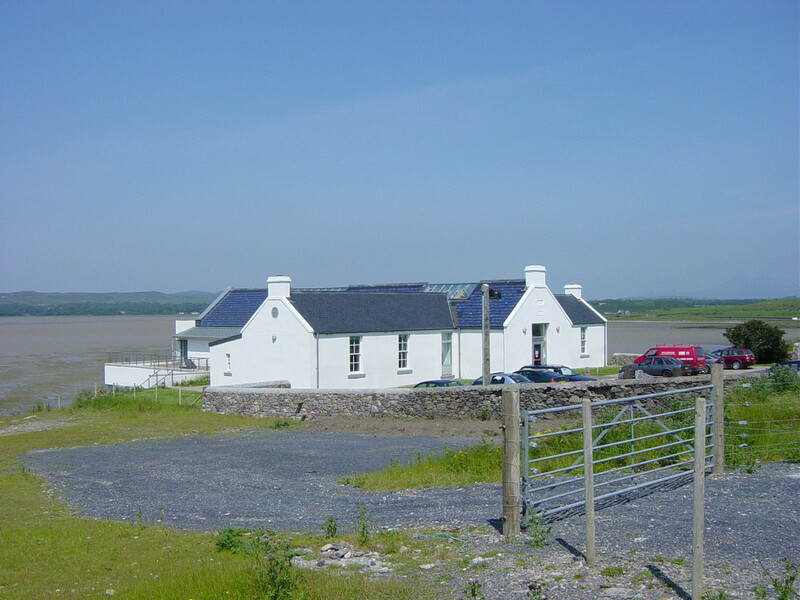 It was recently acquired by the Trustees of Ionad Chalium Chille Ile, and transformed into a centre for Gaelic education. Expansion to the site was started in 2002, and included trebling the floor area by extending roof slopes to the north and creating low ground accommodation under a large terrace podium. The installation of photovoltaic tiles was undertaken on the two long roof slopes, extending from the retained gable at the new entrance out to the northern extent of the roof. The design was intended to be an external indication of the new structure for the central roof, and its use of ‘Sunslates’ was an important aspect in obtaining planning permission. The photovoltaic system consists of a total of 1,644 SES Atlantis Sunslates to 12 inverters. The array’s nominal power output is 19.73kWp. The building is arranged along a North-South axis and therefore the roofs are facing due west and due east. This leads to a reduction in the annual energy output of around 15% but it was decided that both roofs would be covered in Sunslates to maximise the available roof area for photovoltaics.